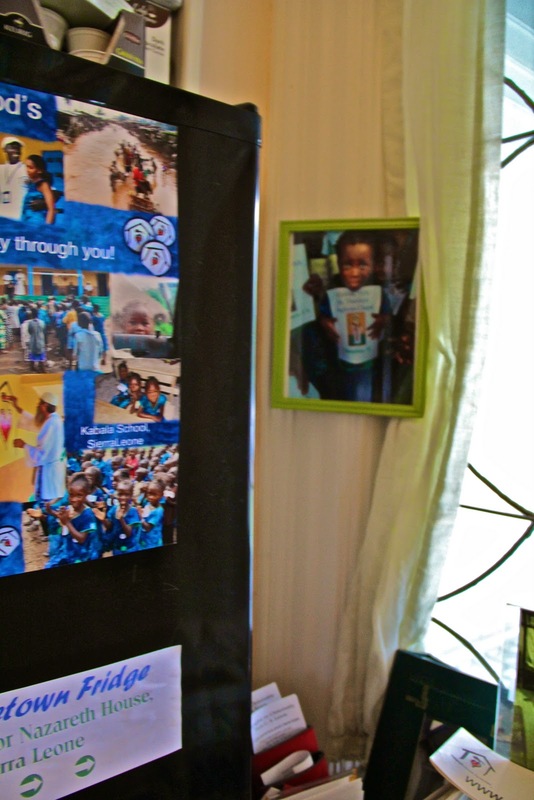 Nazareth House Apostolate is blessed to have friends that support the work all over the world. We remain small in number but HUGE in heart and spirit. As this post is being published, there are many outlets of Nazareth House busily working together to pray and provide beyond themselves. We are most grateful. The needs increase daily and we are thankful for the continued support. You are all named daily in the prayers at St. Simeon Skete . Today we feature our chapter housed in the C.S. Lewis Student Center & St. Theodore's Chapel located on campus of University of South Carolina in Columbia. Seraphim and I recently made a trip to visit the C S Lewis Center and we are amazed by their care and support for the work and the love they show for NHA and the people of Sierra Leone and us. Tonight they will be doing a FAST to raise awareness and funding for the work of Nazareth House Apostolate. If you are able, join them in the fast and/or donate to NHA for the cause. GRACE is inviting you to be involved in the ministry of Nazareth House Apostolate in Sierra Leone, West Africa. Many of you met Fr. Seraphim and Vicki Hicks, founders of Nazareth House, last month during their visit to Columbia. This Fast for Africa will allow you to participate in the ministry you heard them speak of. Nazareth House Apostolate is especially called to pray in areas that have been abandoned and forgotten by the rest of the world. During the horrific ten-year civil war in Sierra Leone, Nazareth House went there to pray and and share God’s love. Today, Nazareth House operates a free school in Kabala, Sierra Leone (along with one meal a day to students) as well as providing medical help to those who fall between the cracks. All of this started simply with prayer! Read more at www.NazarethHouseAP .org. Attached is a sheet for supporters to pledge a certain amount for each hour you fast. At the bottom of this page is a handy table to compute several different levels of giving, but any amount helps, and donors are free to choose their own. Ordinarily, you should collect the gifts after you have finished the fast (no fair accepting funds, and then not following through on the fast). Check off the right column when you collect the donation. If you have medical issues that preclude you from a total fasting from solid food, just do as much as you can, but be upfront with your donors. The normal fast would mean only consuming water during the 24-hour period, but if you need to adjust it to your own situation, then do as much as you can. It really only means missing two meals (breakfast and lunch on Saturday, assuming you eat just prior to the 6:00 p.m. start on Friday), and very few people have ever had to be rushed to the hospital for missing two meals! You may also choose to fast from something besides food, but it should be a real sacrifice of something you ordinarily partake of (tv, computer, etc.). You will be able to participate in the fast completely on your own, but we will have group activities at the beginning and end of the fast, if you would like to participate. Friday, we will start with Evening Prayer at 6:00, praying especially for Nazarath House, and our efforts in this fast. We will follow that by a screening at 6:45 of Blood Diamond, the 2006 film starring Leonardo DiCaprio and Djimon Hounsou, which tells the story of Sierra Leone’s brutal civil war (Location TBA). Saturday, we will end the fast with Evening Prayer at 5:30, followed by an African supper at 6:00. *********************************************************************************During our visit, The C.S. Lewis Center offered a Taste of Africa dinner to raise awareness and support. and at the subsequentTaste of Africa dinner at the Cathedral of the Epiphany Church in Columbia, SC. What a welcome we received! 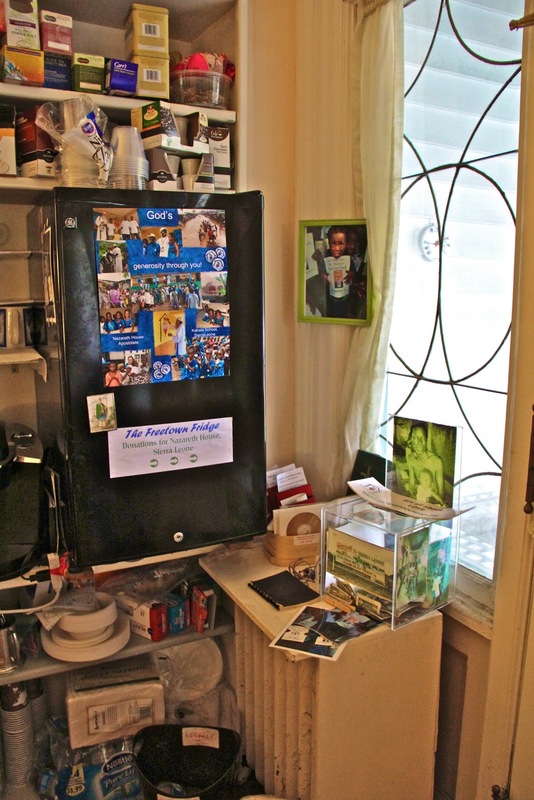 The "Freetown Fridge" remains (drinks are offered for a donation to NHA) in place at the C.S. Lewis Center. It has been raising awareness and funding for Nazareth House for many years now. on the porch of the Center. We enjoyed great togetherness and mutual support. and their eagerness to help those in need. If you find yourself in the Columbia area, look the C.S. Lewis Center and/or the Cathedral of Epiphany up - you are sure to find a gracious welcome.